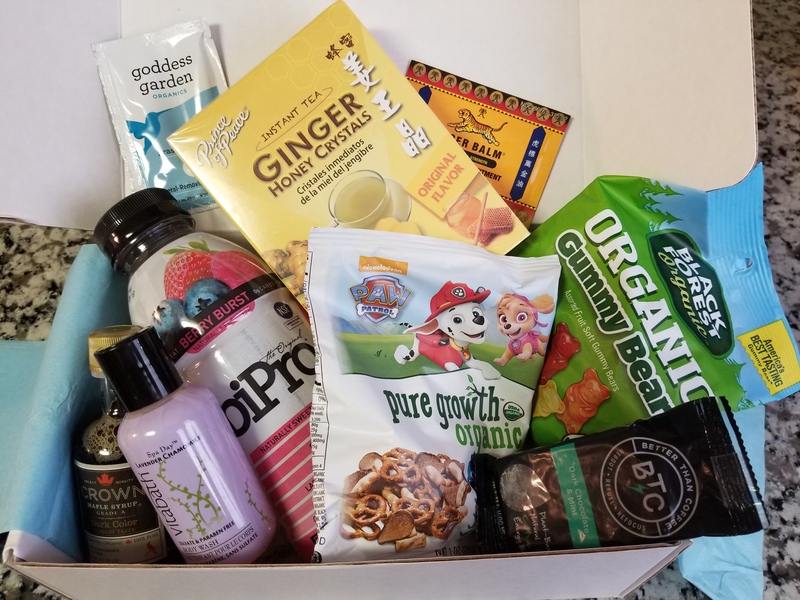 Another month means another awesome Daily Goodie Box to review! Behold the goodies packed inside the April box below. They also included coupons for the companies that provided products this month. The addition of coupons was a smart move, since it’s a nice incentive to order some of the goodies you liked with a nice discount. This granola is made of grains, chia, amongst other natural yummy ingredients. The flavor is dark chocolate sea salt. I had planned to use it in yogurt or as a cereal, but ended up eating it straight out of the bag. Good idea! It tasted very good, and served as a guilt free snack, since the entire package was only 130 calories. If you like granola, highly recommend this brand. The chocolate and sea salt combination was the perfect pair. Check out more Bakery on Main products here, or try this Bunches of crunches grainola. #MPWR is a stick to treat blemishes. The witch hazel extract helps fight pimples, but surprisingly it doesn’t sting when applied. The scent is also not overpowering as with other spot treatment sticks I’ve tried. Applied it to a pimple that had just popped up, and within two days it was gone. It helped in preventing that big red bump stage, and didn’t dry out my skin. I love that it’s organic, non-drying, and does what it says. Get your own spot corrector stick here, or check out more organic #MPWR skincare products. This sunscreen by Goddess Garden is a spf30 for everyday wear. I wore it on a sunny day out, and it definitely protected my arms from getting tanned by the sun. But my favorite part about this sunscreen was that even though it protects from the sun, it’s light. I applied it to my arms and face, and was so surprised by how well it applied on my face. It doesn’t leave a typical thick, greasy feeling as most sunscreens and even better I really couldn’t detect that unpleasant sunscreen scent. Try one for yourself here, or check out more products by Goddess Garden Organics. This little packet packs a big punch of energy. It was a nice taste of strawberry kiwi, not artificial tasting or overly sweet. Gave me a nice pick me up when I needed it, and it faded over time on its own without a groggy feeling left behind. Nice alternative to over sugared and over caffeinated energy drinks. Try your own Eboost energy powder here. I think for most adults, cotton candy brings them back to their childhood. I was very excited to try out Slurpee’s very own cherry cotton candy, and even better to have shared it with my daughter. She tried it and asked “what is this”, when I told her it was cotton candy, she said “I like cotton candy!” The cherry flavor was sweet, and cotton candy was fluffy as it should. It’s nicely packaged for a sweet gift, or party favors. Get one for yourself here! I have always been curious about trying out powdered peanut butter, so this packet was a nice surprise. There were two servings which I used to make smoothies. I didn’t use too many ingredients to make sure I got to taste the peanut butter. This packet was vanilla flavored and tasted very good. No chalky aftertaste, just a nice vanilla bean addition. The nice thing about Peanut Butter & Co peanut butter is that it has less fat than traditional peanut butter spreads and a nice five grams of protein per serving. Check out more flavors here, or you can’t go wrong with their vanilla powdered peanut butter. For that dude in your life, that you want to keep fresh and clean. These handy wipes are pretty much as stated, used to wipe yourself clean when a shower isn’t available. One of the ingredients is aloe, which is great for your skin. My hubby did the honors of trying them out and liked the fact they weren’t scented and didn’t affect his sensitive skin. These are awesome for road trips or to keep in your car in case you ever need to freshen up. Grab some wipes for yourself or that special dude in your life here. I have seriously never been a fan of aloe water, until I tried this one. Detox Water paved the way for me to like aloe water and try other ones to compare to this one. Lychee and white grape was the flavor that came in my Goodie Box. It tasted crisp, not too sweet and quenched my thirst. It didn’t have any aloe chunks as found in other ones, nor the high amount of sugar and calories. I know that aloe is great for digestive, skin and many other issues, which makes drinking this “healing hydration”, as it states on the back of the bottle. Grab some Detox Water for yourself here, and don’t forget to check out other flavors as well! This AdÄmia Therapeutic Repair Lotion is a moisturizing yet light one. It has a very light scent but it’s not overpowering or lingers on your skin. It’s a therapeutic lotion meant for dry or cracked skin, but I liked it enough as a an everyday lotion. The macadamia oil found in this lotion is what makes it therapeutic, as the tube states; macadamia oil mimics skins’ natural oils. Very nice addition to this goodie box, get yourself an AdÄmia Therapeutic Repair Lotion or check out their other products here. Hope this review was useful to you, have you heard or tried any of these products?! ‹ Beauty Benefits of Jojoba Oil: Your New Shaving Buddy	› Considering eyelash extensions? Check out my experience and review first!